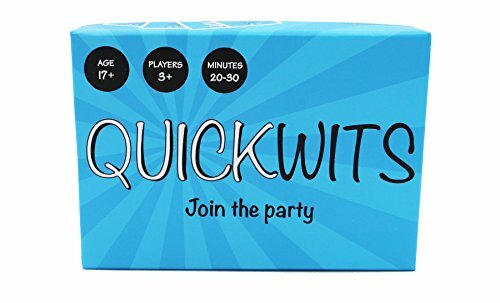 Quickwits: A Party Game Here's how it works 1.) Each card contains a category and a symbol on it. 2.) One by one each player draws a card and places it face up on the table. 3.) When two symbols on the table match, the players race to give examples of the category on their opponents card. The first to do so gets to keep that card. 4.) Once a word has been said during the game it can no longer be used again. 5.) The objective is to win more cards than your stupid friends. There is a very good chance you will be screaming in each others faces. It's okay, that's normal. There are several other types of cards in the deck that help keep the game interesting. For official rules, visit www. quickwitscards. com. .
20-30 minute rounds. Ages 17 and up. 3 or more players. 150 high quality cards.